Ailish Hambel at the podium. Photo by Jennifer Jean Miller. 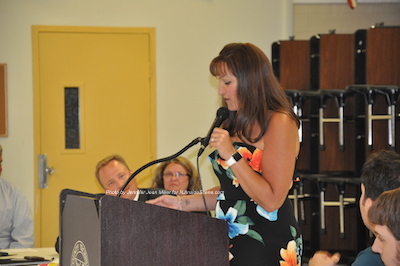 SPARTA, NJ – “I’m not saying goodbye completely, but I’m saying goodbye to the position,” Ailish Hambel, Sussex County GOP’s chair until June 10 told the crowd who packed the cafeteria at Sussex County Technical School that night. “It’s been an honor and a privilege, I’m sad but I need my life back,” added Hambel, who had served since 2009. Ailish Hambel addresses the group about her resignation. Photo by Jennifer Jean Miller. 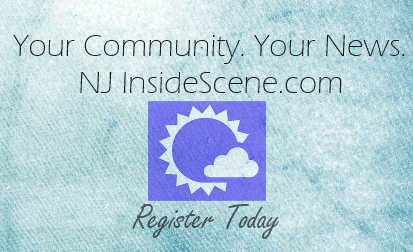 “It’s too much, it’s gotten so hard,” Hambel told NJInsideScene.com that night before she took to the podium. 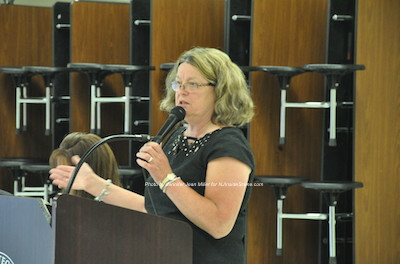 Hambel thanked the group and those she volunteered with, thanking everyone for their respect and cooperation. 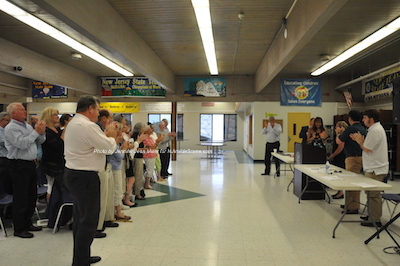 In return, the entire group rose to its feet to give her an ovation, with Senator Steve Oroho (R-24) leading the group in applauds. From there the group must choose a new chair by June 30, with the location for the event to be announced, which Jill Space, who is sitting in as acting chair, explained will be a process more like a reorg type of meeting, rather than a convention. Republican Committee meeting attendees. Photo by Jennifer Jean Miller. While Space has an interest in staying on as chair, and she feels she would be the most suitable for the role based on her experience, she explained to the group that she cannot, in order to avoid what some may perceive as a conflict of interest, because of her campaign support for spouse, Assemblyman Parker Space. However, Jill Space has been a GOP volunteer for 14 years. 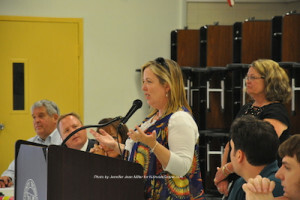 “This has been my passion,” she told NJInsideScene.com. 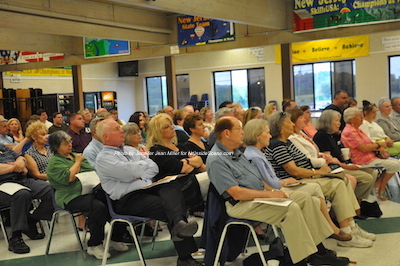 Both Jill and Parker Space joined the Sussex County Republican Committee those many years ago, long before he began representing constituents in county and state roles. Before Parker Space was a freeholder, Jill Space was serving as a vice chair when Rich Zeoli was the party’s chair. And then Hambel came on in 2009. The Spaces began volunteering their time as the male and female representatives on the state committee. Then Parker Space began serving as freeholder in 2010. Jill Space. Photo by Jennifer Jean Miller. Parker Space is permitted as an assemblyman to maintain his volunteer role as state committeeman. 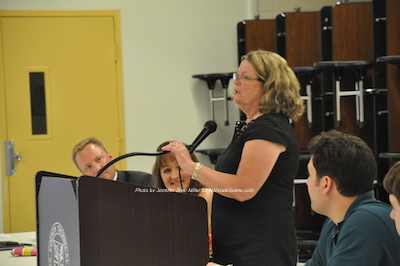 Jill Space has become reputed for her attention to detail and understanding of the processes in the county GOP, having served under two chairs and having been vice chair. Space said the next likely progression would have been to run for chair, based on her experience and has been torn by the decision that she will not be vying for the role. Senator Steve Oroho in the foreground leads the group in the ovation for Ailish Hambel. Photo by Jennifer Jean Miller. Another person who has expressed an interest in the role is Jerry Scanlan, who has been an active volunteer with the GOP and who has decided to throw his hat into the ring. Scanlan said he has worked for over 25 years with AT&T, Lucent and then Alcatel-Lucent and hopes to blend his corporate experience, with his volunteer experiences in municipal, county and state politics. 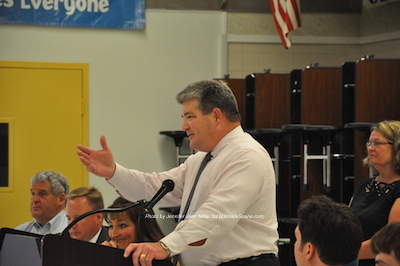 Scanlan is also vice-chair of the Sussex County Community College Board of Trustees. Scanlan said he realizes it is up to the vote of the group members, but says if he is chosen, he plans to build more grassroots efforts to support the party and candidates. “Over the coming days and weeks, I hope to talk, meet and listen to as many County Committee members as possible. 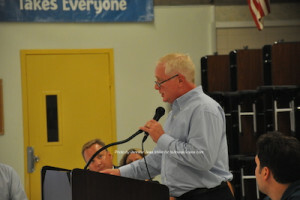 I hope to earn your vote on June 30th.,” he posted on social media when he discussed his candidacy. Ploetner holds a degree from Fairfield University in International Human Resource Management and Business and Environmental Law. He has worked in an executive role in the automotive industry and launched his concierge purchasing company, I-Deal Acquisitions, which handles capital and luxury purchases in the aviation, marine and auto sectors for businesses and companies. Ploetner considers himself versed in contract negotiation, relationship building, and people skills that he says would help him in his candidacy. He is on the board of directors of the national Chris Craft Antique Boat Club and is an active member of the Branchville Rotary Club. Alison Littell McHose, who has been wearing two hats as she winds down her role as assemblywoman and took on the role of Franklin Borough Administrator on Jan 1, thanked Hambel and said whomever assumes her role, the party will be behind them, helping in support. Alison Littell McHose. Photo by Jennifer Jean Miller. Senator Steve Oroho. Photo by Jennifer Jean Miller. Sussex County Clerk Jeff Parrott. Photo by Jennifer Jean Miller. County Clerk Jeff Parrott also thanked Hambel and said he would miss her. He also thanked Jill Space, noting all of the information she provides to anyone is given with great accuracy. While Oroho brought news back from Trenton about the vote on the upcoming budget, Parrott discussed positive initiatives that have impacted the whole state, but emerged from Sussex County through Oroho, McHose, Space and former Assemblyman/current County Surrogate Gary Chiusano, including veterans’ drivers licenses, veterans’ ID cards and license plates for veterans. Editor’s Note: This article was updated on June 18 with information about Donald Ploetner’s interest in the chair position.